Texas A&M University-Texarkana student leaders accompanied university president Dr. Emily Cutrer to Austin, Texas this week. The group met with various legislators and state officials regarding the university’s accomplishments and mission to improve the lives of those in the East Texas region and beyond. The A&M-Texarkana delegation was recognized in both the House and Senate sessions when District 1 State Representative Gary VanDeaver and Senator Bryan Hughes introduced resolutions proclaiming Monday, April 8, 2019 as A&M-Texarkana Day at the state capitol. The day was highlighted by meetings with Lieutenant Governor Dan Patrick and Speaker of the House of Representatives Dennis Bonnen. 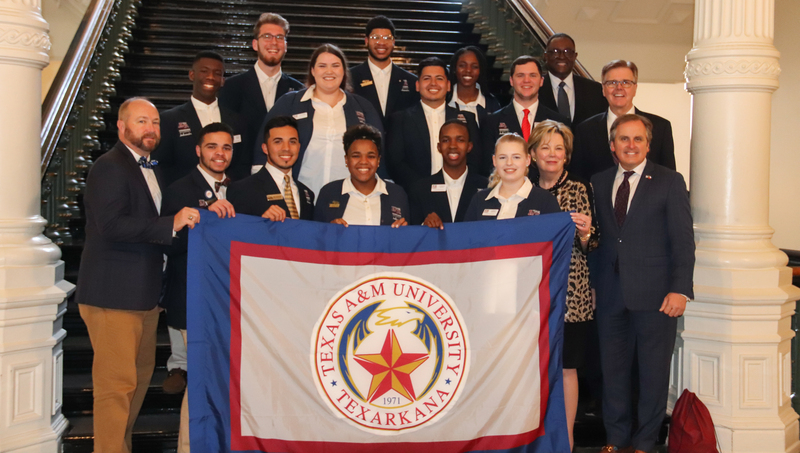 Students participating in A&M-Texarkana Day at the state capitol included Phillip Barnes – Texarkana, TX, Brent Baldwin – North Richland Hills, TX, Sebastian Barrientos – Arlington, TX, Logan Caudill – Magnolia, TX, Tino Charuma – Dallas, TX/Zimbabwe, Africa, Tamar Coby – Longview, TX, Philip Derouen – Lafayette, LA, Alex Hernandez – Texarkana, TX, Vallerie Klingbeil – Arlington, TX, Jarrell Lawrence – Lewisville, TX, Sabrina Melton – Idabel, OK, and Lamonte Scott – Euless, TX/Detroit, MI. In addition to Dr. Cutrer, the students were accompanied by Mr. Mark Missildine, Alumni Relations Coordinator and sponsor of the university’s Student Ambassador program and Mr. Frank Jackson, Assistant Vice Chancellor for State Relations with the Texas A&M University System.